How the English Language is Formed? Languages are formed when people living in groups begin to find certain behaviors, bodily movements, or gestures as symbols. People in different groups would use different sounds and body movements which would explain some six thousand languages spoken in our world today. We have never found a group of people that have not had a spoken language. 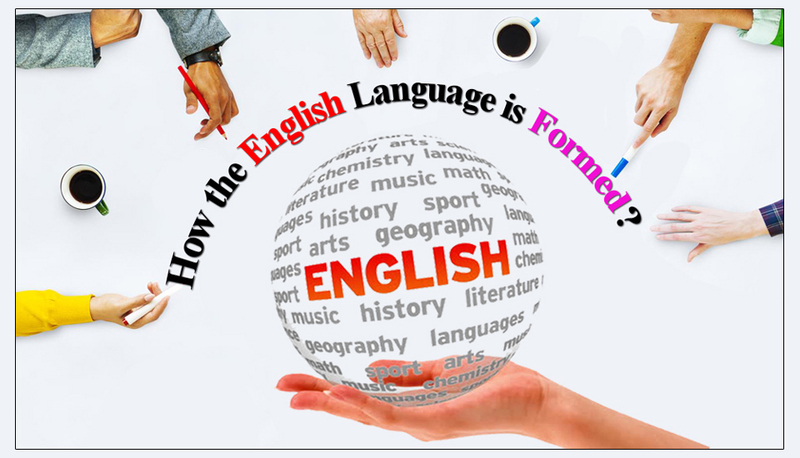 Of all languages English language is called international and worldwide spoken language, therefore we must know how the English language is formed, read in the article below about the formation of the English language. Morphemes are what make up words. It is not always true that morphemes are words. Some single morphemes can be words, while other words have two or more morphemes within them. It is also incorrect to think of morphemes as syllables. Many words have two or more syllables but only one morpheme. “Banana”, “apple”, “papaya” and “nanny” are just a few examples. On the other hand, many words have two morphemes and only one syllable; examples include “cats”, “runs,” and “barked”. In so-called isolating languages, like Vietnamese, each word contains a single morpheme; in languages such as English, words often contain multiple morphemes. Free morpheme: a morpheme that can stand alone as a word without another morpheme. It does not need anything attached to it to make a word. “Cat” is a free morpheme. Bound morpheme: a sound or a combination of sounds that cannot stand alone as a word. The “s” in “cats” is a bound morpheme, and it does not have any meaning without the free morpheme “cat”. Inflectional morpheme: this morpheme is always a suffix. The “s” in “cats” is an inflectional morpheme. An inflectional morpheme creates a change in the function of the word. Example: the “d” in “invited” indicates past tense. English has only seven inflectional morphemes: “-s” (plural) and “-s” (possessive) are noun inflections; “-s” (3rd-person singular), “-ed” (past tense), “-en” (past participle), and “-ing” (present participle) are verb inflections; “-er” (comparative) and “-est” (superlative) are adjective and adverb inflections. Derivational morpheme: this type of morpheme changes the meaning of the word or the part of speech or both. Derivational morphemes often create new words. Example: the prefix and derivational morpheme “un” added to “invited” changes the meaning of the word. Allomorphs: different phonetic forms or variations of a morpheme. Example: The final morphemes in the following words are pronounced differently, but they all indicate plurality: dogs, cats, and horses. Base: a morpheme that gives a word its meaning. The base morpheme “cat” gives the word “cats” its meaning. Affix: a morpheme that comes at the beginning (prefix) or the ending (suffix) of a base morpheme. Note:An affix usually is a morpheme that cannot stand alone. Examples: “-ful,” “-ly”, “-ity,” “-ness.” A few exceptions, namely “-able,” “-like” and “-less” can also stand alone as words. Note: Types of Morphemes By Kirsten Mills University of North Carolina at Pembroke, 1998 edited by Mark Canada, Ph.D.
Homonyms: morphemes that are spelled the same but have different meanings. Examples: “bear” (an animal) and “bear” (to carry); “plain” (simple) and “plain” ( a level area of land). Heteronym: one of two or more words (not necessarily single morphemes) that have identical spellings but different meanings and pronunciations, such as “row” (a series of objects arranged in a line), pronounced (rō), and “row” (a fight), pronounced (rou). Homophones: morphemes that sound alike but have different meanings and spellings. Examples: “bear” / “bare”, “plain” / “plane”, “cite” / “sight” / “site”.